Feeling much better, I thought I would check out ticket prices for the Big Game tomorrow. I found a ticket site and clicked on "Best Available". It came back with an offer of a ticket in the end zone for a mere $50,000. Humm... maybe I better set my sights a little lower. Well, the lowest price ticket available was $9,000 way up in the nosebleed section. I think I will watch from the comfort of my RV. 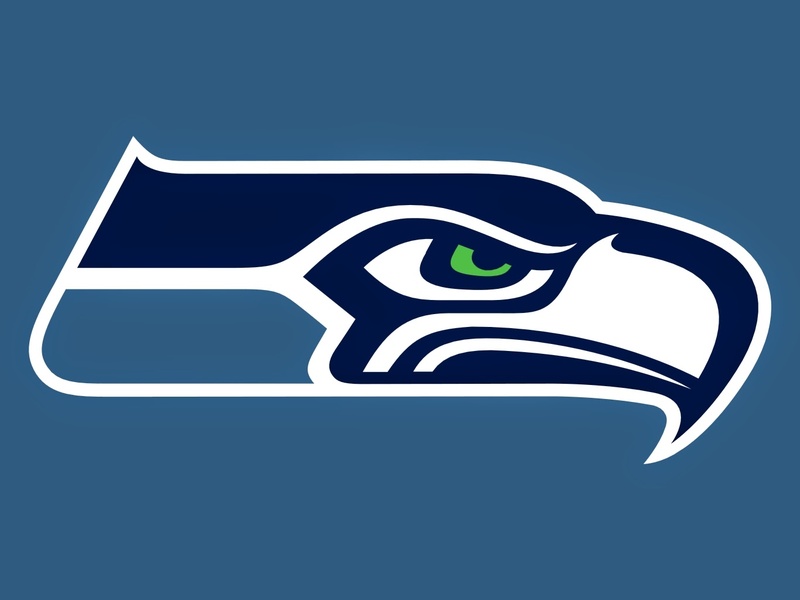 I am looking forward to the game, cheering on my Seahawks. I was a little disappointed with the antics of running back Marshawn Lynch "Beast Mode" at Press Day when he set an alarm clock for the five minutes he was required by the league to answer questions and then answered every question with, "I'm here so I don't get fined". If I was paid eight million a year and my boss told me to attend a press conference and answer questions on some product, that is what I would do, no matter if I thought the questions were dumb or simplistic. I understand Lynch is shy but come on, for eight million a year he can answer a few questions. I will however allow "Beast Mode" to redeem himself with his play tomorrow where he can show he is not shy about breaking tackles and scoring. Much, much better today. I actually managed to get a little "real" food (other than soup) down and stayed upright for an hour. I am not going to push things but I am over the hump. Norma is doing a little better than me and actually walked to the dumpster with three bags of garbage. Yesterday was Day Three of this flu - crud or whatever you want to call it. I was feeling a little better and actually spent an hour or two out of bed playing on the computer. Then last night about seven, Norma suddenly came down with the same thing! It was very sudden with her. She went from feeling fine and working in the kitchen to flat on her back hallucinating over the space of maybe twenty minutes. I turned off the lights and TV shortly after and we both went to sleep only to awaken at about ten, thinking it was morning. Neither of us slept well the rest of the night. My problem was a sore back from spending so much time in bed. I got an email from our friends Brian and Sue saying they had both had the same thing and it lasted a week with two days being really bad. I hope those two days are behind me as one of us has to be able to heat soup for the other. Well, lets see what today brings. This is the best description I can give this headachy, congested, sore muscle thing I am going through right now. I got the first sign of it at the restaurant when I had to keep clearing my throat and it got steadily worse. I spent most of yesterday in bed and might actually feel a little better this morning. We shall see. 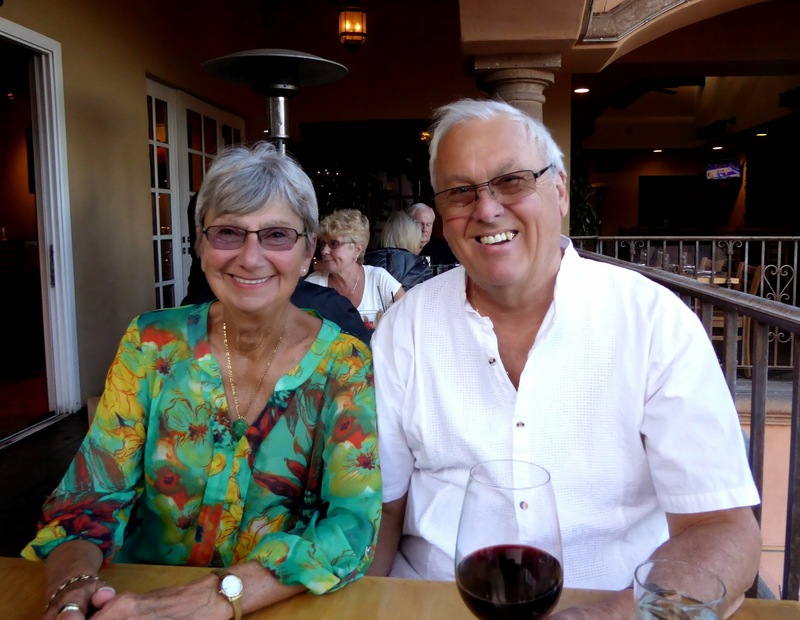 Dining Out In Palm Springs! Our dining out budget this winter so far is about a third of what it was last winter. Last year we were in Cajun country and on the Gulf so we were out sampling the local fare on a regular basis. 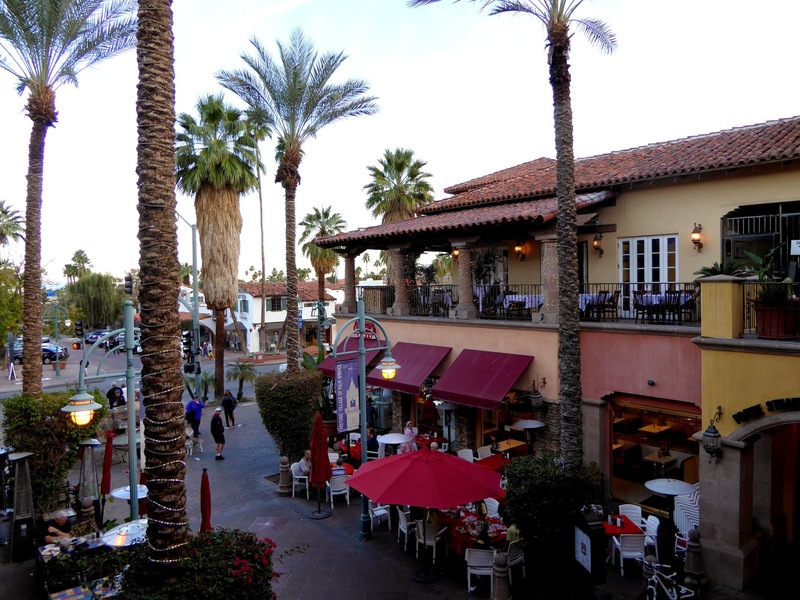 Here in Desert Hot Springs we are about twenty minutes away from "The Drive" in Palm Springs where all the restaurants are located and because it is Palm Springs, prices are reflective of the location. Yesterday we made an exception. Norma's second cousin Jay was in town renting a condo for a few weeks and we had made arrangements to pick him up and go to dinner. We arrived at Jay's '50's style Palm Springs condo at about 3:00 and headed downtown. We parked and walked for a good hour until we spotted the Matchbox Restaurant with second floor balconies overlooking the street. It looked very inviting and we got a great table on the balcony. Norma ordered pork, Jay the chicken and I gambled on the seared salmon. I always hesitate ordering salmon in a restaurant because they sometimes substitute real salmon with the farmed variety. This however was perfect! Nice wild caught salmon, perfectly cooked on a bed of spinach. I forgot to take a photo of the dishes! My new Windows 8.1 computer developed a problem in the last week. When I went to Start-Shutdown and clicked the button the machine would restart instead of shutting down. This would happen every time. The only way I could shut it down was by holding down the power button. I Googled the problem and found this page. It took a while but I followed their detailed instructions and now everything seems to be working again. I don't know exactly which of their steps fixed the problem but after turning off all the Startup and Services entries in msconfig and then turning them back on again one at a time, it now works properly. This afternoon we are going downtown to meet up with Norma's cousin Jay who is renting a condo here for a month and going out with him for an early dinner. It will be fun to get together with family. Wow! What a nail biter that was. I expected a close game but I never thought Seattle would find themselves down fourteen points! Oh well, all's well that ends well! What about Sherman? I think he finished that game with a broken hand. What an attitude! I would not want to be the coach who tells him he cannot play! The park Internet has been very difficult to get on lately and if you were lucky enough to get on, it would drop you in a short time. I gave up today and bought 30 days worth of my Virgin Broadband. All is good now. We just got an automated call from my primary Visa card company saying there are "odd" transactions going on and to please call them. I called and was told someone has cloned my card and has charged $8,500 against it in Montreal in the past few hours! She reassured me that I was not responsible for the charges and then ascertained when I last used the card and what the last few legitimate charges were. She asked if I had the actual card in front of me and I assured her I did. She said the fraudsters had a duplicate card that they must have cloned. She told me to cut the card up and that she would send me a replacement card with a new account number ASAP. They must have some sort of fraud fund that they use to cover these transactions but man, they must add up! This is not the first time this has happened to me. and I have been more careful this year. I no longer leave the card with a gas station attendant while I fill up and if a place or their employees look shady, I use cash. I guess it is just one of those things, if they want it bad enough, they will get it. I have not felt any of these. I guess I will have to start paying attention! 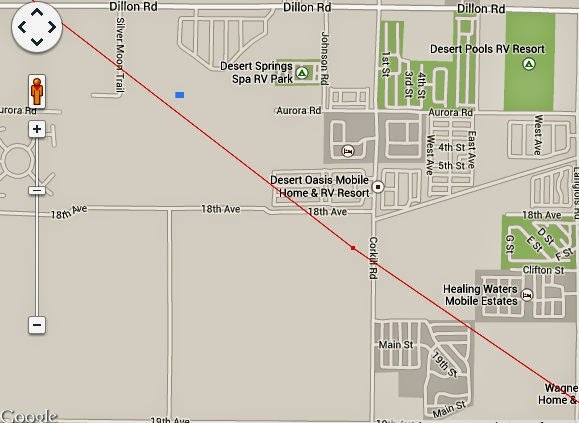 No, it is the San Andreas Fault and it passes right through Desert Hot Springs! In fact it is only a few dozen feet from our site! 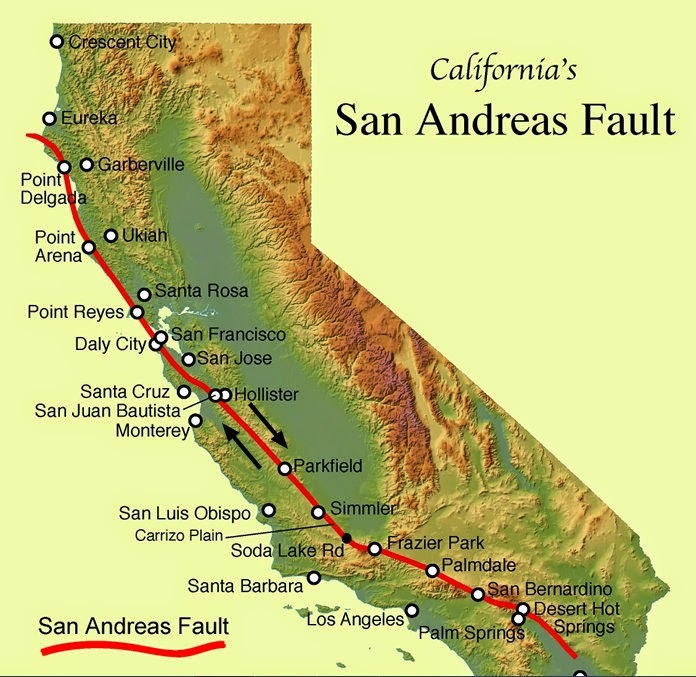 The San Andreas Fault is the sliding boundary between the Pacific Plate and the North American Plate. It slices California in two from Cape Mendocino to the Mexican border. San Diego, Los Angeles and Big Sur are on the Pacific Plate. San Francisco, Sacramento and the Sierra Nevada are on the North American Plate. And despite San Francisco’s legendary 1906 earthquake, the San Andreas Fault does not go through the city. But communities like Desert Hot Springs, San Bernardino, Wrightwood, Palmdale, Gorman, Frazier Park, Daly City. Point Reyes Station and Bodega Bay lie squarely on the fault and are sitting ducks. The two plates move past each other at the average rate of a couple of inches per year, at times getting hung up and sticking together until enough pressure builds up to suddenly release them and they move a foot or two all at once, creating an earthquake. 1) What makes one of these photos what conservatives call a "Patriotic display of Constitutional Rights" and the other what they call, "Terrifying"? 2) Can you tell which is which? 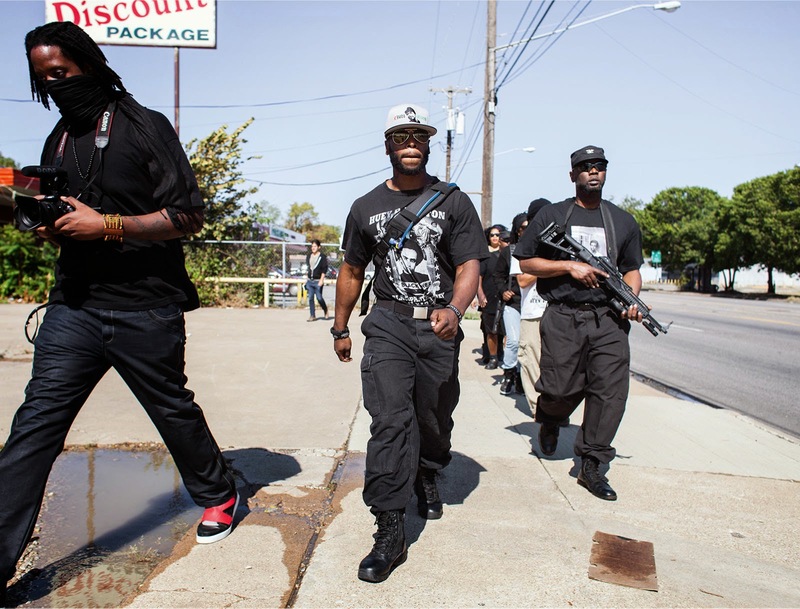 Conservatives love love LOVE the Second Amendment right up until the point where black people start exercising it. The other day our friendly neighbors from Alberta were over for Happy Hour and Francis mentioned he could not get Skype to work on his computer. I said I would have a look at it for him so yesterday he brought it over and I started it up. Right away an AVG window popped up saying there was a virus. He said, "ignore it, it happens all the time and I can't do anything about it". I clicked the 'remove' button and nothing happened, AVG would not work. He said his daughter had installed AVG a long time ago but he had never updated it. I thought I would be the smart guy and uninstall AVG and install MSE, a better product that just works away in the background, updating itself whenever required. Well, I finally got AVG uninstalled and then things got worse, much worse. Windows were popping open everywhere and it would not let me go to the MSE site, putting me on other third party sites instead. I knew better than to let it do this but try as I might, I could not download MSE. I closed the computer before I did any more damage. I was about three feet over my head and the computer was worse than when I started, or at least I thought it was. Last night I emailed my friend Rick who is wintering just down the road, asking for help. I hated doing this because it was not his problem or even his neighbor but at this point I had little choice. Rick answered right back that he would be glad to help so we set up a time of 9:30 this morning. I thought it was just going to be a simple matter of downloading and installing MSE but no. As soon as Risk turned it on he knew there were serious problems. He discovered many malware programs that were redirecting search requests. When he tried to install Revo Uninstaller, it would not let him do it. He used some professional tricks and installed Revo which found probably twenty malware programs (all in Russian) which he slowly eliminated. The ten minute job had now taken almost three hours! Our neighbors are happy, Skype works again and Rick got some mental exercise trying to out think the Russian malware writers. As he was leaving he told me that in his 50 years of doing this both as a hobby and professionally, this was the worst he had ever seen. The computer was completely taken over and was unusable. Thanks again Rick! I learned a lot from this exercise as well and might be able to get further next time I try to help. 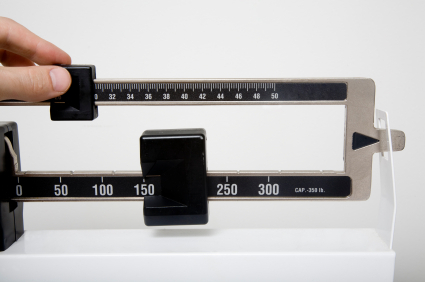 Earlier this year when I went to see my doctor he asked me how much I weighed. I gave him my standard off-the-cuff answer of, "250, same as always". He gave me 'that look' and told me to get the nurse to weigh me. 260. I got the textbook warning and he told me to take advantage of my winter in the south to lose some weight. Well, I have not been walking much more than I do at home but I have been eating better. Well maybe not better but fewer restaurant meals. Many fewer. Last year we were in Cajun Country and in other parts of the south that (justifiably) pride themselves in their cuisine and we took advantage of it. Here, we hardly ever go out for meals. Our 'dining out' budget is down about $450 and our groceries are about the same as last year. My calorie count is down for the count. I started noticing my pants were all too big and that I have only one belt with me that will tighten up enough to keep my pants up. Here at the park they have a scale with the sliding weights which everyone says is quite accurate. I got on it and after deducting one pound for a wet bathing suit, it shows 226! I am wasting away. Not really. My 'ideal' weight according to the Internet is +/- 205. The Internet would't lie, would it? Hot 'Nuf Fer Ya Now? I could tell first thing this morning. It was time to shed some covers. Palm Springs is HOT! Well, not hot in terms of bygone years but hot compared to what we have experienced the last two years! It is, "Where is the turn the pool temperature down thingy"? hot. Yesterday we drove over to the neighboring park where George and Suzi were staying to say "Hi". We stopped at the gatehouse to get their site number and were told they had left suddenly. Checking George's Blog, we see there was some issue in Suzi's family and they had to return home. 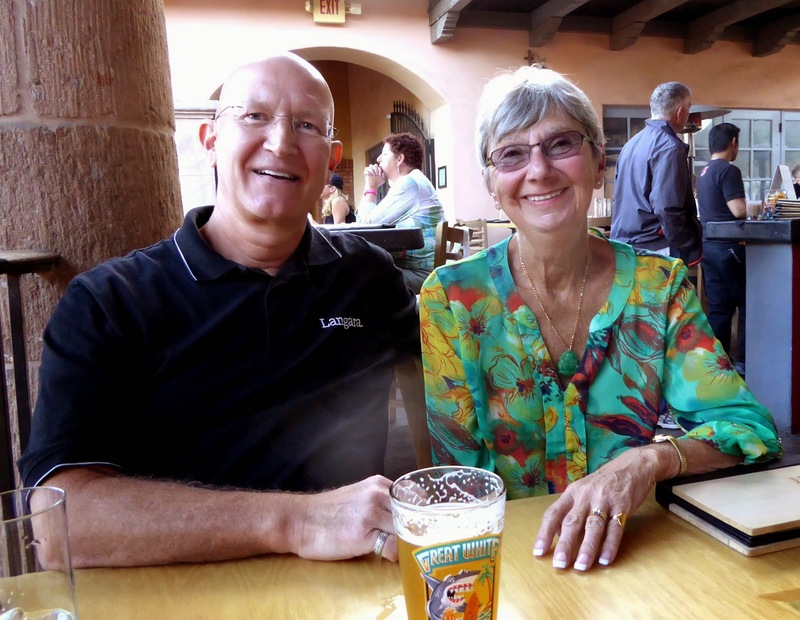 They drove to Phoenix where Suzi flew home and George will follow, driving the rig. Leaving it behind is not a convenient option for them because their RV is also their home when they are back in Ontario. These things do happen and in fact will happen to most of us at one time or another. We wish our friends safe travels and we know it will not be long before they are back on the road. 11:45 PM. That is how close to 2015 I made it before heading off to bed. Not a big deal, we celebrated the New Year with the ball dropping in New York City. Norma persevered for an additional twenty minutes or so just so she can say she did. It was COLD overnight! Just above freezing. Tonight we have a freeze warning so I disconnected and drained the water hose after filling the on-board water tank. Next we high-tailed it to the sale at JC Penney's and bought an electric mattress pad with dual controls. This will be much more effective and cheaper than keeping the electric heater on low. There appears to be a warming trend coming but they have said this before. We really do not know what we are going to do come the 18th. Stay tuned.